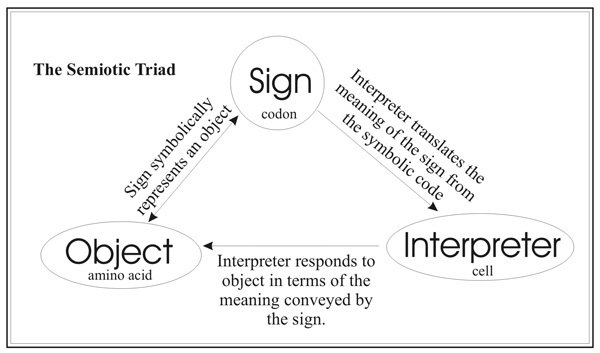 The semiotic triad. In genetics, the amino acid is the object that is symbolically represented by the codon, which the cell interprets via the translation mechanism (the ribosome). Thank you for all the work you put in. Your site is very easy to use, with a wealth of articles. I especially like the “Surprise me” section, where you can browse a random choice. This article was fascinating, though it was sometimes a stretch to understand, because of my lack of knowledge in this field. 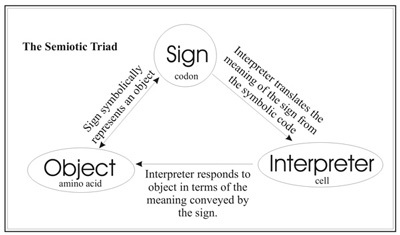 I understand that in many cases the sign and object are indeed according to an arbitrary code (in languages for example—the same meaning can be conveyed in a multitude of different ways); but don’t see how that can be so in the case of the genetic code. Of course, GOD created DNA, the genetic code itself and the very laws of chemistry and physics that make them work. However, I thought that the actual production of RNA or proteins, from DNA, COULD be explained in terms of the laws of physics. Surely biological molecules such as DNA operate by a mechanism that depends on the physical configuration of the molecule? The base pairs fit together according to the laws of physics—don’t they??? The symbols are arbitrary. They have nothing to do with the function of the instruction coded by those symbols. The operation of cellular machinery obeys the laws of physics without exception. But that isn’t what the author is talking about here. He is talking about how the symbolic meaning of a given DNA sequence is arbitrary because there’s no inherent reason why a specific DNA sequence has to code for any specific message. In the case of DNA, there are four bases (A, C, G, and T). This is not necessary, however, as a base-two system (say just A and G) would equally suffice. The code would look radically different, but the same messages could be spelled out nonetheless. Our computers all run on base-two (zeros and ones) and they operate just fine. Likewise, if we were smart enough to program in base-four, our computers would run the same (for the user, not the programmer!) (See especially Dr Robert Carter’s talk on The Multidimensional Genome given at the 2011 Creation Superconference). Thus, the symbols are arbitrary. They have nothing to do with the function of the instruction coded by those symbols. For example, we know that the three-base DNA sequence ATA (the sign) is one of the standard codes for the amino acid isoleucine (the object) in protein-coding DNA (the context) in the nucleus. Why is it that way? There is no real reason other than this is the significance the ATA sequence has for the cell mechanism that implements the genetic instructions (the interpreter). However, in vertebrate mitochondrial DNA (a different context) ATA codes for a different amino acid, methionine.1 Moreover, ATA may mean a number of different things in non-coding DNA (another different context), but by definition it doesn’t code for either isoleucine or methionine in that context because these sections of DNA are not coding for protein, by definition. Therefore, what changes is not the physical configuration of the DNA code, but the different contexts the code is in (nucleus vs mitochondrion, protein-coding vs non-coding sections) and the interpretive mechanisms used to read the DNA code. In different contexts, the same sequence of symbols can have vastly different meanings. Maybe another linguistic analogy will help. Consider this sequence of symbols: g-i-f-t. In English, that sequence of symbols connotes something transferred from one person to another with no expectation of repayment for the thing transferred. However, the same symbol sequence means “poison” in German. It can also happen in the same language: “I can’t bear the thought of that bear roaming free!” The same symbol sequence “bear” means something completely different depending on where it is in that sentence. The first usage is verbal, meaning “to endure”; the second usage is a noun referring to a particular type of large, omnivorous mammal. In different contexts, the same sequence of symbols can have vastly different meanings. I love this article, and plan to use it in my discussions with evolutionists. However, I do have a problem with the frequently repeated creationist claim that “the DNA code is identical in virtually all organisms because … the Creator wanted to show that life had only one designer.” This seems highly unlikely to me. God, who sees the end from the beginning, already knew, when he created life, that the DNA code would be discovered by man during a period of time when most scientists were either atheists or deists who believed in a single creator God. God would not have chosen one method of creation (similar DNA) over another (dissimilar DNA or a variety of non-DNA molecules) just to keep scientists from drawing the incorrect conclusion that there were multiple creators. I sincerely doubt that any modern scientist who was Christian, Jewish, or Islamic would begin to question his faith just because animals turned out to be more different on the inside than they are on the outside. If that was His motivation, he made a serious error, because it is a fact that many believers are indeed questioning their faith because of the similarities. No. The similarities are due (in part) to the fact that God is efficient. He would have chosen to repeat similar patterns in different creatures even if He knew man would never discover those similarities. All engineers know it is better to take an existing design and modify it than to design each new product from scratch. Why have hundreds of different letters when you can create an almost infinite variety of words with only 26 or less? Also, we share the same world, breathe the same air, eat the same foods, and therefore have to share the kinds of similarities we see in order to survive. I know you know all this, but I felt it needed pointing out because I imagine most evolutionists feel the same way about the “same DNA means same creator” argument as I do. We need to emphasize all the other reasons why we have to be so similar on the inside even when we look completely different on the outside. Thanks for letting me voice my objection. God bless you, and keep up the great work you are doing for the Lord. Creationists need to respond to the evolutionists’ argument that ‘homologies’, such as common anatomy and biological universals (e.g. DNA, left-handed amino acids, ATP), provide strong evidence for evolution. One of the most helpful contributions to this discussion has come from Walter ReMine, author of The Biotic Message. ReMine argues that life has been purposely designed (1) to make clear that it is the product of a single designer and (2) to resist naturalistic (evolutionary) explanations. In order to achieve (1), the designer unified the natural world by incorporating identical features across all organisms and similar features across many organisms. Even man is seen to be the product of this same designer, being so close in many respects to the apes. However, despite the vacuous claims of the secularists, scientists cannot point to natural processes which appear to be remotely capable of giving rise to the complexity seen in the natural world; sequences of fossil transitional forms are conspicuous by their absence; and the so called ‘homologous structures’ often develop through totally different embryonic processes. This fulfils (2) above. Recently, I heard Jonathan Sacks (UK’s Chief Rabbi) argue that the ubiquitous nature of DNA in all life was irrefutable evidence for evolution. He is, however, quite wrong. The use of DNA as the carrier of genetic information unifies life and fulfils (1) above. The fact that there are some organisms that utilise a different DNA code (some of their codons coding for different amino acids) fulfils (2) above. If one organism evolved into another with a different code, all the messages already encoded would be scrambled, just as written messages would be jumbled if typewriter keys were switched. The fact that the DNA code, utilising four letters and three letter words, is an optimal design in terms of information storage, translation and accuracy of information transfer, also fulfils (2) above –see Werner Gitt, In the Beginning was Information, pp. 94, 95. [Dr Gitt’s sequel to this book, called Without Excuse, updates and refines the arguments considerably—Ed.] This is because, to evolve into the optimal form, different variations of the code would have to be tried (and favoured or rejected by natural selection). As explained above, this is totally unrealistic—unless there were numerous simultaneous changes in the writing and reading processes which is so improbable as to be absurd. Is information a ‘false metaphor’ for DNA? Takemoto, C., Spremulli, L.L., Benkowski, L.A., Ueda, T., Yokogawa, T. and Watanabe, K., Unconventional decoding of the AUA codon as methionine by mitochondrial tRNAMet with the anticodon f5CAU as revealed with a mitochondrial in vitro translation system, Nucleic Acids Res. 37(5):1616–1627, 2009. Note that ‘AUA’ is the RNA transcript of the ATA sequence in protein-coding DNA. The DNA base thymine (T) is replaced with another base uracil (U) during transcription. Return to text.